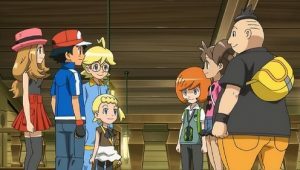 Clemont and Ash are ready to begin, and Clemont is about to call out his first Pokémon, but before he can Chespin comes out of its Poké Ball ready to battle. 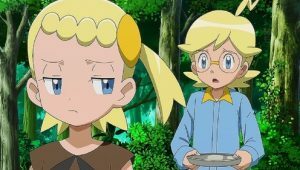 Clemont also goes with Bunnelby. 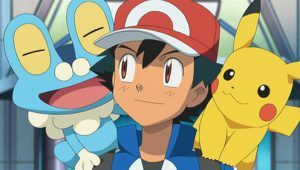 Ash decides that Froakie’s partner will be Hawlucha. 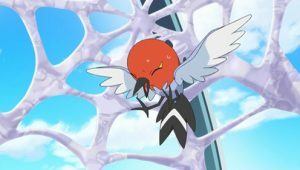 When Hawlucha is called out it stands in a pose as Bonnie referees. 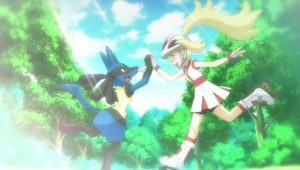 Ash tells Hawlucha and Froakie to work together as a team, and before any battling begins Hawlucha holds out a fist to get a fist bump from Froakie. 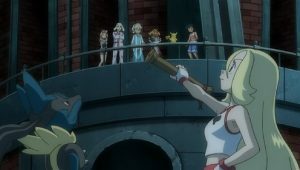 Froakie hesitates, but it does eventually give Hawlucha a fist bump and the battle begins. 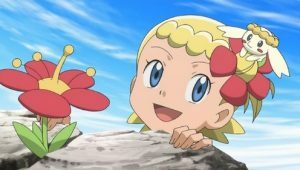 Clemont goes first telling Chespin to use Tackle on Froakie and Clemont tells Bunnelby to use Double Slap on Hawlucha. 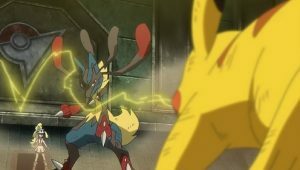 Ash tells Froakie and Hawlucha to dodge. 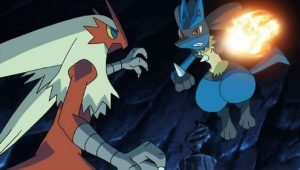 Hawlucha, however, doesn’t dodge and just takes the Double Slap hits from Bunnelby. 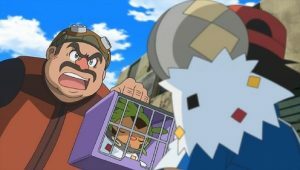 Ash is impressed to see Hawlucha testing Bunnlby’s strength, but Froakie isn’t impressed. 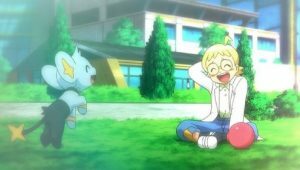 Ash tells Froakie to use Bubble and Hawlucha to intercept with Karate Chop. 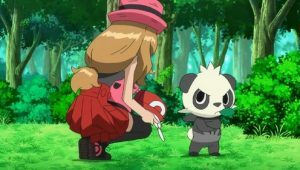 Clemont commands Chespin to use Vine Whip while Bunnelby keeps using Double Slap. 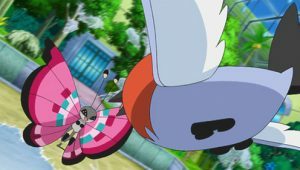 Both Bunnelby and Hawlucha took hits as Clemont then tells Bunnelby to use Mud Shot on Hawlucha. 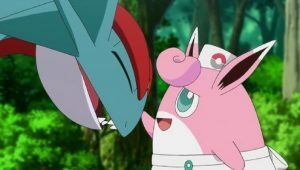 As Bunnelby gets ready, Ash tells Froakie to use Water Pulse on Bunnelby to help Hawlucha out. This is where everything gets intense. 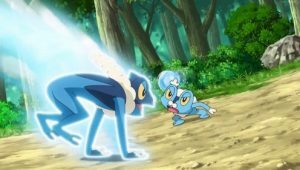 Froakie uses Water Pulse on Bunnelby which is a successful hit, and this makes Hawlucha furious. 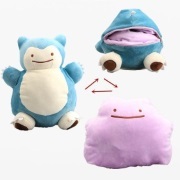 It goes over to Froakie and begins yelling at it for getting in its way. 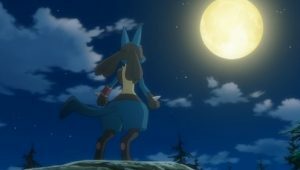 As Chespin uses Pin Missile, Froakie dodges and the pins ended up hitting Bunnelby instead, getting knocked out in the process. Soon, Hawlucha gets so furious with Froakie that it uses High Jump Kick on it. 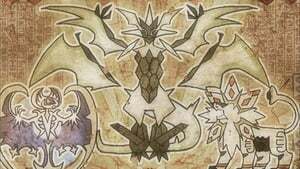 Now Froakie’s the one who’s furious and it attacks Hawlucha with Cut. 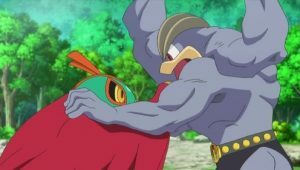 Hawlucha attempts to use Flying Press on Froakie, but gets confused because Froakie uses Double Team. 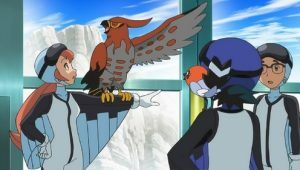 Soon Ash breaks up the fight and tells Hawlucha and Froakie to stop, and the battle is called off. 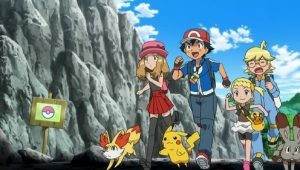 Ash takes Froakie and Hawlucha away from the rest of the group and tells them they need to work together because they’re on the same team. 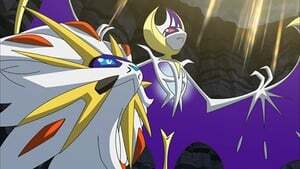 He comes up with a combo move for the two of them which he calls the “Super Flying Cut”. 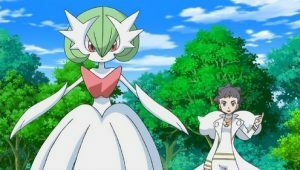 It starts out with Froakie riding on Hawlucha’s back, and then it jumps and uses Cut, and then Hawlucha finishes with Flying Press. 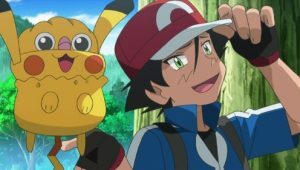 Ash decides to start working on training, but Hawlucha stops Ash and tells him it thinks it and Froakie should make up for their argument first, and it extends its hand to Froakie attempting to apologize to it, but it turns away. 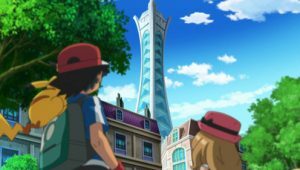 Ash tells Froakie to make up with Hawlucha, but it still won’t, and this causes more fighting between the two. 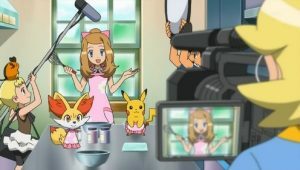 Meanwhile, Clemont is making lunch for the group, and Serena gets out a basket of homemade Poké Puffs for the Pokémon, which makes most of them happy, but Chespin nervous. 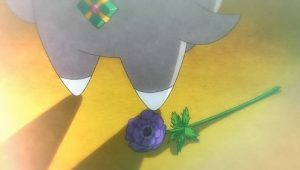 When Serena opens up the box, the Poké Puffs are gone. 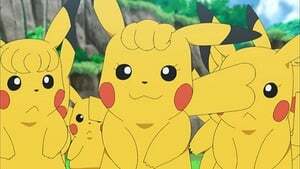 The gang demands the Pokémon to fess up to eating them, but they all shake their heads, expect Chespin who looks the other way. 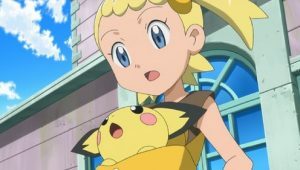 Serena remarks that even if no one will admit it, she’ll know who the culprit is because she put in spicy Poké Puffs specially for Fennekin. 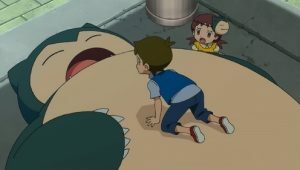 All of a sudden, Chespin turns red and fire shoots out of its mouth, revealing Chespin was the one who ate all the Poké Puffs much to Serena, Bonnie and the Pokémon’s anger. 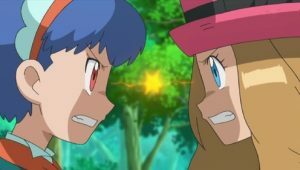 Off near the forest Ash is attempting to work on “Super Flying Cut” with Hawlucha and Froakie, but the two keep getting angry at each other and the bickering continues. 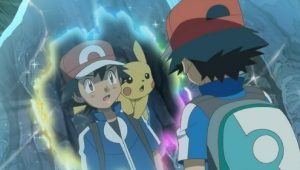 Ash is fed up at this point and scolds the two for their behavior. 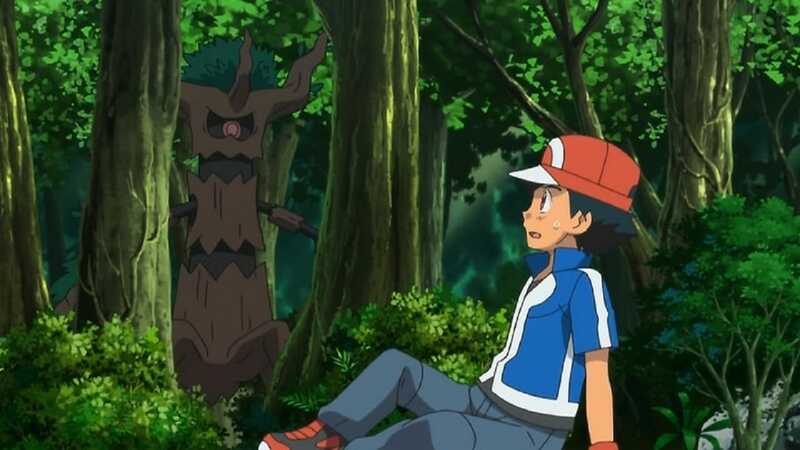 He starts to instruct them to use the combo again, but he is dragged into the forest by a wild Trevenant. His friends hear the noise and rush over to see what’s wrong. 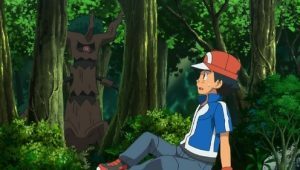 Meanwhile in the forest, Ash sees he’s being carried away by Trevenant and scans it with his Pokédex. 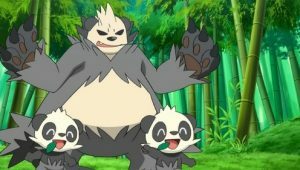 He tells Trevenant he’d never do anything to hurt the forest and yells at it to let him go. 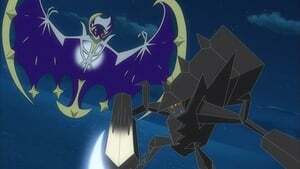 Hawlucha and Froakie see this and attempts to rescue their trainer but they get caught in vines. They look at each other and growl angrily before looking the opposite direction. 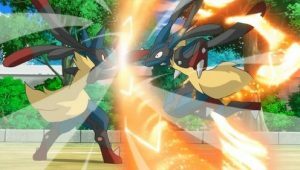 Froakie begins swinging itself back and forth to try and shake loose from the vine, and Hawlucha does the same, but the two end up crashing into each other, causing them to argue once again, and this is enough to make the vines snap and free them. 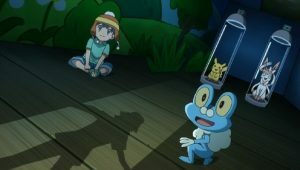 Froakie then sees Ash’s hat on the ground and hands it to Hawlucha who puts the hat on its head. 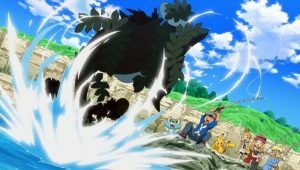 When the two find Ash they begin to battle Trevenant. 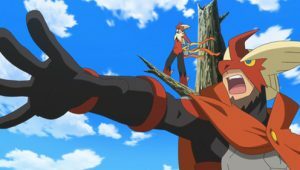 Hawlucha attempts to use High Jump Kick, and Ash explains to it that Trevenant’s immune to Fighting type Moves because it’s a Ghost type. 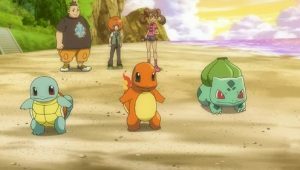 After Ash gets freed from Trevenant and reasons with it, it leads him, Hawlucha, and Froakie to a net where a wild Bonsly and Sudowoodo are being held. 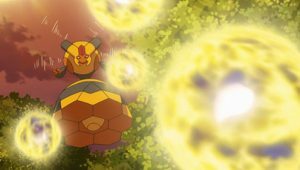 Ash attempts to free the two Rock types but gets shocked by the net. 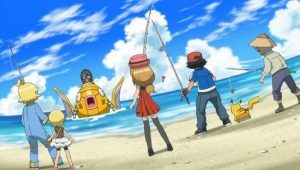 Just then Pikachu and the others come along as Ash tells Pikachu to use Iron Tail to free the two from the net before he gets caught in one. 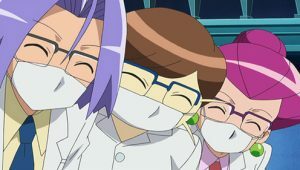 No surprise, Team Rocket are the ones who caught Pikachu in the net. 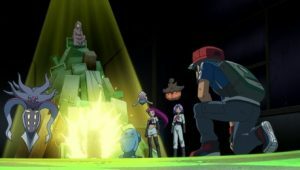 A battle begins, and Ash has Hawlucha and Froakie battle Team Rocket. 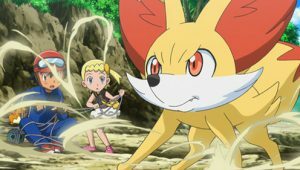 Jessie’s Pumpkaboo uses Shadow Ball, but Froakie and Hawlucha both dodge it. 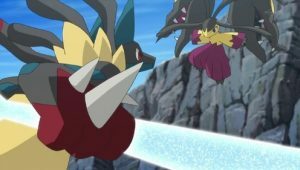 Froakie uses its Frubbles to blind Pumpkaboo as Hawlucha prepares to use Flying Press. 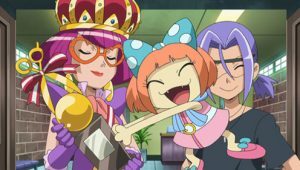 But being part Ghost type, Pumpkaboo was unaffected as Jessie states that Fighting type moves won’t work as Ash says he’s one step ahead as Froakie uses a close range Water Pulse at Pumpkaboo, knocking it out. 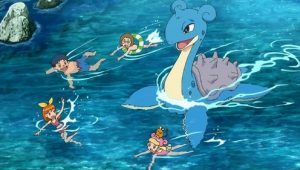 Clemont states that Flying Press was used to distract Pumpkaboo so Froakie will use a successful Water Pulse. 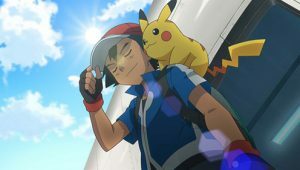 After dodging James’s Inkay’s Tackle and Psybeam, Ash tells Hawlucha and Froakie to use “Super Flying Cut” and they get the combo perfect, knocking out Inkay. 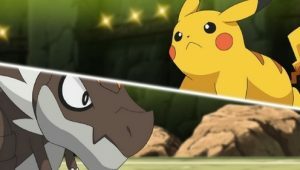 Before Team Rocket is about to leave, Trevenant then comes along and uses Wood Hammer to smash the remote and free Pikachu from the net. 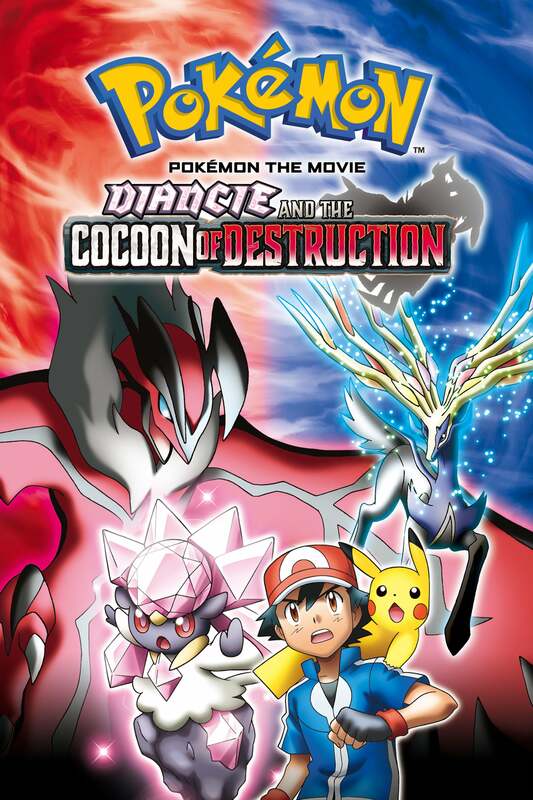 Pikachu then blasts Team Rocket off with Thunderbolt. 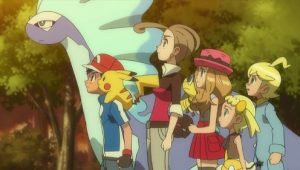 With Froakie and Hawlucha having put their differences aside, Ash and his friends say goodbye to Trevenant, Bonsly, and Sudowoodo as they head off towards Ash’s Shalour Gym battle.